I’m gonna’ make this place your home. I have to admit that 2017 was a very hard year for us. Parenting teenagers (really REALLY parenting teenagers, the hard stuff), job stuff, money stuff, depression, stress. It just kind of sucked in 1,000 ways. I probably cried more than any other year of my life. Except maybe 2016 when it all started sliding downward. 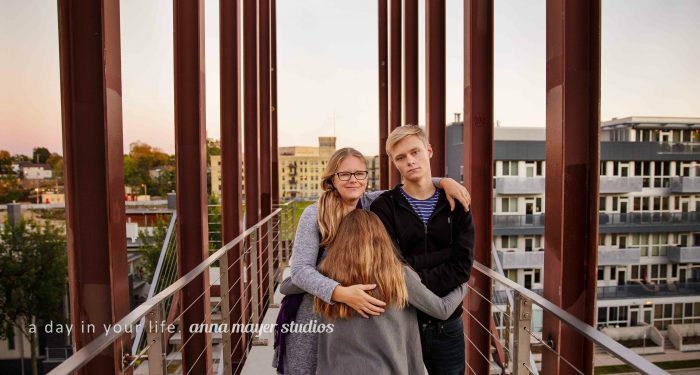 In October, because it’s tradition for us to take photos and create an awesome Christmas card and despite the stress that was vibrating my cells 24-7, we washed our faces, brushed our hair and our teeth and met up at the Marsupial bridge for our family shoot. To say I wasn’t feeling it would be a massive understatement. An hour before we arrived there was a terrible fight. There was a terrible discovery and setback. There were tears. There was anger. It was bad. I wanted to run away from it all. I wanted to scream. The last thing I wanted to do was a family photo shoot. But this is my family. These people who make me cry and make me want to scream and run away, they are also the people that make me laugh, that give me joy, that give my life meaning and purpose. These are My People. Somehow, despite all that was happening . . . we still laughed, we still played, we still smiled. We were still a family. Because, well, that is family; tears, screams, thoughts of running away right alongside laughter, hugs and smiles. No family is all sunshine and roses. All families have stress and chaos and pain. When it was time to edit these and make a card, though, I couldn’t do it. I couldn’t even look at them without feeling it all over again. I left the files unculled, untouched and used different photos for our card. Until last week, when I pulled them out again. With the perspective only time can give you I thought about how much I loved these people, even in that moment when loving them literally hurt. I remembered how blessed I am to have each one of them in my life. I see these photos as a pillar of gratitude, a statement of faith in us; no matter what we go through, we are a family and we will keep smiling and loving (and screaming and crying and fighting . . . ). Because these are My People. No. Matter. What. PS The song, too, speaks to what it means to be a family in good times and bad. Love that song.